If you’re looking to buy a printer for a small to midsize workgroup, the HL-4070CDW makes an excellent choice. Brother’s color laser packs a ton of useful features—wireless networking, duplexing capabilities, and PostScript compatibility (via emulation)—while still delivering speedy performance, ease of use, and excellent print quality. And at $500, you can’t complain about the price. The HL-4070CDW is easy to set up, other than the fact that it weighs 64 pounds and requires at least two people to unpack safely. Installing the toner cartridges is simple; you can access the printer’s drum unit by pressing a convenient release button on the front cover. The HL-4070’s paper tray is large and easy to slide open, unlike many other printer trays I’ve dealt with in the past. When setting up the software, Brother gives you the option to install drivers for three different connection types: USB, Ethernet, or wireless. Creating a USB and Ethernet connection is very straightforward, but configuring it for wireless use involved a long process that ended up being a bit of a hassle. 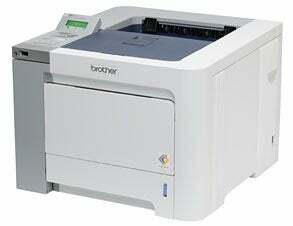 The HL-4070CDW is one speedy printer. In our tests, it took 18 seconds to print a one-page Word document, 45 seconds to output a 10-page Word file, 57 seconds for our 22MB test image, and 35 seconds to print a four-page PDF. Things slowed down a bit when we tested the unit’s duplexing chops. It took 1 minute and 51 seconds to print a 10-page Word document on both sides of the paper. This result lagged behind our Top Product in the laser printer category: The Oki C6100dn ( ) took just 54 seconds to complete the same test. All in all, the unit produced exceptional print quality, especially in our Graphics: Fine Lines, and Gradients test. Lines came out smooth and well preserved while gradients were clearly distinguished and graphics looked very pleasing. Black text was also impressive—clean and professional looking, even at small point sizes. Color text was a little lacking: Some hues, such as yellow, appeared slightly jagged and less refined. But when it came to printing photos, colors appeared vibrant and vividly accurate, making the HL-4070CDW an excellent device for printing presentations and brochures. With duplexing and wireless or wired network connectivity, the Brother HL-4070 offers a very impressive set of features for the price. Performance and print quality are top-notch too, making this a superb color laser printer for smaller offices and workgroups.